Early on in The Light Thief, a radio broadcast makes mention of one-time Kyrgyzstan president Askar Akayev, whose reported corruption and eventual overthrow in 2005 is referred to as the Tulip Revolution — something seen as an opportunity for democratic change that ultimately resulted in additional violence, corruption and Western influence. 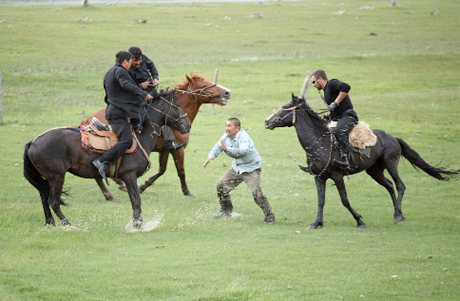 Related televised protests shown later in Abdykalykov's initially blithe allegory stress these subsequent political implications, giving further context to a narrative that follows a humble Kyrgyz village being visited by Chinese investors. Initially, the titular light thief, Svet-Ake (Aktan Abdykalykov), worries only about having a son, given he has only daughters, spending his time maintaining electrical upkeep for the residents of his village. Aware of the moral ambiguity in his stealing light from a nearby power grid, he dreams of someday generating power from a series of windmills, which he innocently shares with Bekzat (Askat Sulaimanov), a former villager turned land developer. Unsurprisingly, this glimpse into a rural way of life evolves into a parable of trust and the exploitation and destruction of innocence. Svet-Ake's wife jokes that he trusts too openly, believing that everyone is good and bound by the values demonstrated within their village. It's a warning, as is his unknowing linkage to modernity and globalization through the use of electricity. Much of this film is populated with meaningful imagery, such as the trajectory of playful donkeys gradually turning feral and sexual, along with the plight of a boy stuck in a tree trying to see past the mountains that guard their home from the rest of the world. Tension increases the closer the developers and investors get to the village, and with the villagers' curiosity about the external world.